Your choice of presentation technology probably extends to Microsoft PowerPoint or Apple Keynote. But after that your choices are often made for you. Your projector (or, beamer), or even an HDMI capable TV monitor is typically part of the furniture in a modern meeting room. And sometimes you might not even present with your own notebook pc or Apple Mac. Your presentation will be loaded on a USB stick or disk and presented on someone else’s computer. However, that’s the moment that your control starts to slip. And it’s often when most anxiety, fear and doubt set in. That’s understandable. However, there are three things that you can do. You have some choices to make. When you plan to use a laptop computer, presentation software and a projection device, it pays to be prepared for the presentation technology. Aim to practise and familiarise yourself with everything. Arrive early for your presentation slot. Set up everything and have a quick run-through. 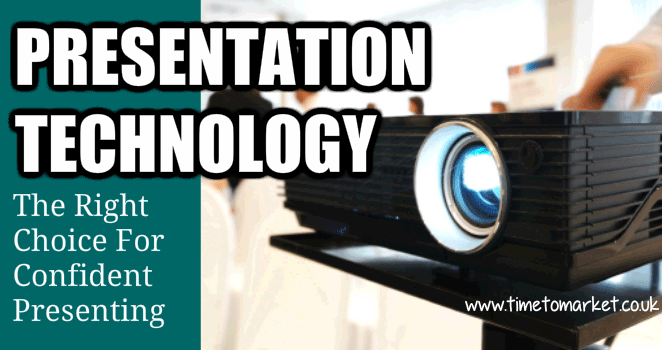 Aim to practise with all the presentation technology that you will use when you present. Learn and rehearse the connection between your computer and a projector. Run through the controls that ensure you have an image on the screen and on your notebook. Don’t forget to familiarise yourself with your mouse or computer touch pad or touch screen. Note the single clicks, the double clicks, how to advance and how to go back in your presentation. If you plan to use a wireless remote, then carry some spare batteries. Arrive early for a presentation where external presentation technology will be used. Set up all the equipment before anyone arrives. Test it. If things aren’t working, ask for help. If you can’t arrive early, ask the presentation organiser if you can set up the presentation the day before. Presentation technology is a primary cause of presenter’s nerves. But it doesn’t need to be so. When you get to grips with all the elements, you will feel a real boost to your presenting confidence. You can also find out more about smartphone presentations with this blog review. A PresentPerfectTM presentation skills training course will give you more insight into your use of presentation technology when you present. Please don’t hesitate to get in touch when you feel that the time is right.